This guide has been published to help you understand the approvals process so that you can start accepting orders via the YourWelcome platform. If you have any further questions, please contact our support team who will be happy to answer any questions that you have. Note: You will only receive requests from Services that have requests enabled. Please ensure that is set up before proceeding with this guide. 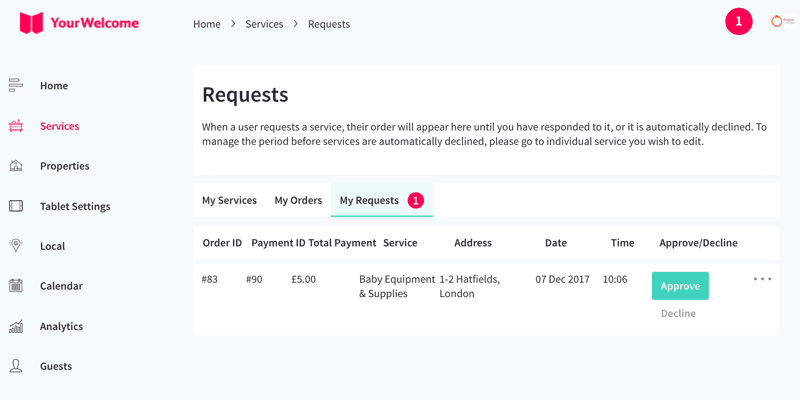 When you have enabled requests for a service, the order flow is altered and a new step is added. 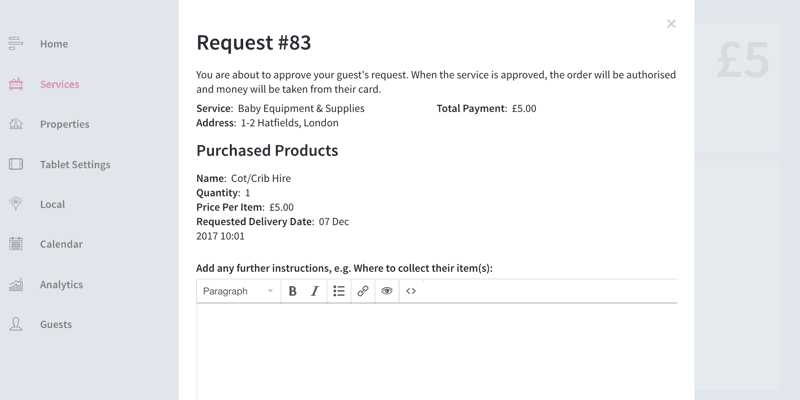 When your guest places an order for a service where you have enabled requests, a new request is generated. The card that the guest has used to pay for the service is pre-authorised for the full amount the moment that the order is placed, and the guest is notified that their request requires your approval. When there is a new pending request you will receive a notification in the YourWelcome Dashboard, along with an notification email. For a request to become an order, it must be approved. 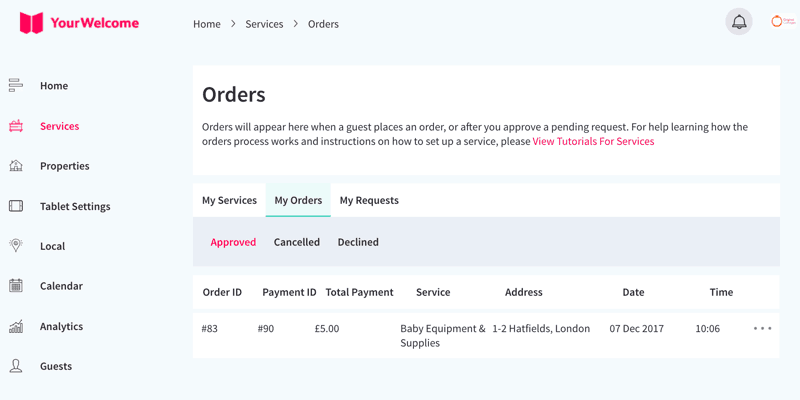 Requests that are declined, or automatically declined, will not appear in your orders list (they are still visible under their own declined and cancelled lists). Select the request you want to approve from the list and select the “Approve” button (or, if you’ve been sent an email select the button in there). A pop-up will appear that will allow you to approve or decline the service. You can also leave an optional message to explain why, or provide further instructions – this message is included in the email to the guest. 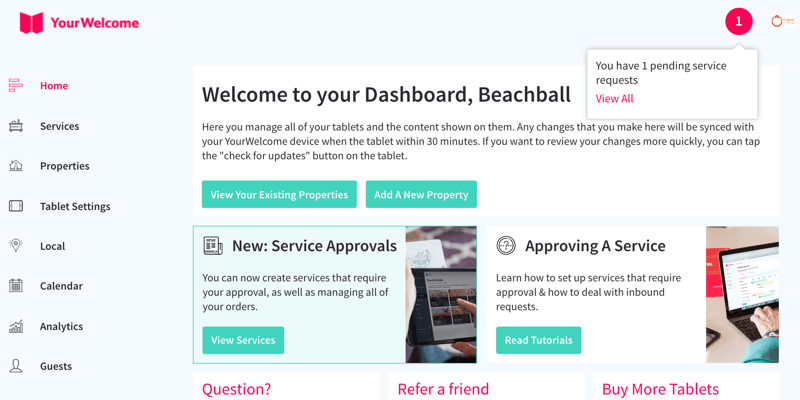 When you approve the service, a notification is sent to your guest by email to let them know. From here, the request has now been approved and will appear in the Orders list. The steps to decline a request are almost the same as approving a request, expect you will need to select the options to decline instead. For all services with requests enabled, an auto-decline period must be set. If you do not action a request, it will be automatically declined when the (time that the order was made + auto-decline period) has passed. When the order is created, it’s then left for you to fulfil. If you’re unable to fulfil an order or need to arrange a cancellation or refund, please contact the YourWelcome support team.